We commissioned this set from our Mongolian friend Bayaraa. Mongolians do not use last names. Bayaraa is a Christian in Mongolia. He signed his name on the back of the wall hanging (Mongolians use the Russian Cyrillic alphabet). Bayaraa is disabled from a back injury and must use a wheelchair. He lives in a ger, which is a traditional Mongolian nomadic tent. This hanging is made from a sheet of wool from Mongolian sheep. The sheet is almost one-quarter inch thick and the wool has a simple, rustic appearance. 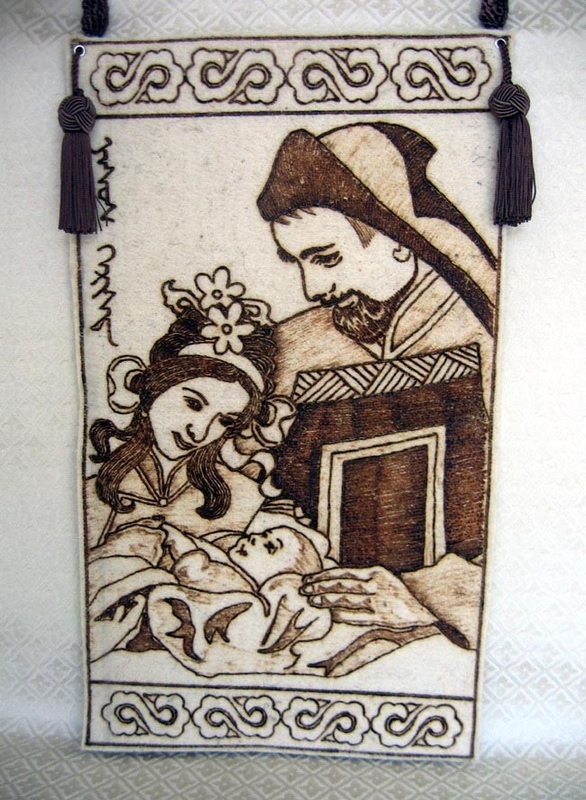 The design of the Holy Family in native Mongolian dress has been burned into the wool with great skill. The hanging measures 20.5 inches tall by 12 inches wide. Mary’s costume reflects the lavish Mongolian married woman’s headdress resembling wild sheep horns or wings. The wing motif has an aesthetic symbolism, derived from a legend about a woman who looks like a bird with two wings who is protecting the hearth. The Mongolian name for the headdress is usnii daruulga, which means that it covers hair. Another feature of great interest is the script written on the upper left side of the hanging. While Mongolians have used the Russian Cyrillic alphabet since the early Twentieth Century when Russia invaded Mongolia, the Mongolian people also have an ancient Mongolian script. The script on this hanging means "Jesus Christ" in the Mongolian Old Script.